School is out for the holidays and your kids are looking for something fun to do while you are making all the holiday preparations. (Or you maybe you are trying to pull teenagers away from their cell phones and video games.) Usher those little elves into the kitchen to help you prepare and serve your holiday meals. They will have great fun hanging out with you in the kitchen preparing some of their holiday favorites. Research shows that when kids help out with shopping and meal prep, they are much more likely to eat what is served because they helped prepare it! 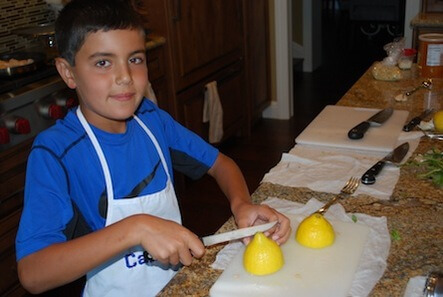 Here are five tips on getting your children interested and engaged in cooking. Include your kids in menu planning. Have your kids help you build a menu of their holiday favorites surrounded by whole foods, rich in color and nutrients. Remember to give them my “Four Color Challenge” to build meals including at least four different colors from whole plant foods to provide their bodies with a variety of micronutrients. Gift each of your kids an apron, mixing spoon and cutting board. Ownership of these basic kitchen tools welcomes a child into the kitchen and makes them feel more comfortable tackling the tasks you assign them. Kids love to stir, blend, chop and decorate. Teach them kitchen safety, and age appropriate knife skills and let them help you chop vegetables and nuts, stir soups and sauces, and mix batters. Give them ownership of one of the holiday menu items. Younger kids can help arrange the veggie platter, while older kids can tackle making an appetizer, side dish or dessert. They will feel very accomplished sharing their creations with friends and family at the holiday table. Let them help serve up their creations and make sure everyone at the table know who made the dish. Ask kids to be food critics – When cooking together, ask their opinions on how they think the foods tastes. Does it need more salt, pepper, cinnamon, or cayenne pepper? Kids like to have their opinions matter. Encourage experimentation and reward creativity. As kids spend more time in the kitchen, they will want to experiment with different cooking techniques and flavorings. Give them recipes with choices to do so. Click here for a recipe kids love to make and are surprised at how much they like the taste! It is a simple appetizer that they can take ownership of serving to guests upon arrival before a holiday meal. 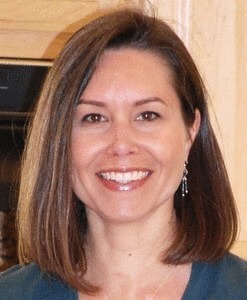 Angela Stanford is a Holistic Nutritionist, Registered Dietitian and Founder of Vital Nutrition & Wellness. She offers nutrition counseling, teaches workshops combining yoga and mindful eating, and helps people start edible backyard and patio gardens. To learn more about Angela, book a FREE 15 minute consult or learn about her upcoming classes and workshops, visit www.vitalandwell.com. A great way to bond with your little sous chefs in your life. Thank you for another valuable article Angela. Great suggestions! My daughter enjoyed kitchen time with me and was more adventurous trying a new dish she helped create!